Late July and parts of August can be a very tough call. Agricultural demand for water is high and the high temperatures effects the fishing on this river greatly. Sometimes temperatures drop well below normal during this period and the good fishing is resurrected. Traditionally caddis are the primary hatch, with some stoneflies and a variety of mayflies during this period. One of the many lakes near the timber line in the Lost River Range . However fishing the Big Lost river or the streams around it are not your only options. There are over 100 mountains lakes in the area with more than 30 stocked with fish. Fish originally were not present in any lakes prior to being introduced by man. They were first stocked in the lakes in the late 1800's or early 1900's during the historic copper and gold-mining era. About five lakes have developed self sustaining populations and are no longer stocked. However, natural reproduction does not occur in most lakes due to a lack of spawning habitat or reproduction is not sufficient to maintain desired catch rates. Access to the lakes varies. Some lakes are accessible by trail while others require cross-country travel. The distance from access roads to the lakes varies from about a half a mile to several miles. 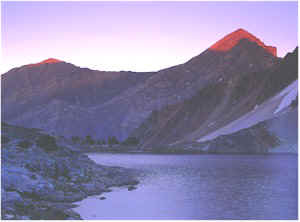 Most of the lakes are located at elevations between 9,000 and 10,500 feet. Ice leaves the lakes between May and August depending on the particular lake and year. It's important to remember the climate on the ranges and change rapidly, in some cases dropping 30-40 degrees within hours. In a nutshell, dress appropriately and dress in layers. Autumn may be the best time to fish in the Lost River Valley. Temperatures are comfortable, few anglers are about and the bold colors of autumn are among you. Needless to say a heavier tippet is recommended. The fish tend to be more aggressive this time of year. Anglers should do well using Blue Wing Olives and Black Baetis as mayflies are normally present during the warmest part of the day. If you happen upon a pool, nymphs work well and if all else fails, casting a streamer is enough to tout some of those autumn pigs. 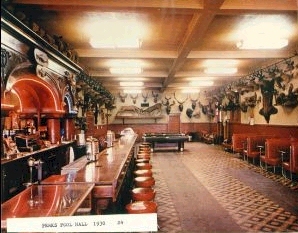 The bar supposedly was won in a gambling game and brought from Cape of Good Horn in 1917. Overall the Lost River Valley is quite a good fishery with bold and beautiful scenery. The two larger towns, Arco and Mackay have very interesting histories dating back to the 1800's and it would be of good educational value to stop and visit these two communities. Season: Big Lost River, Memorial Day Weekend thru- October 31st, November 1st- March 31st catch & release only. Species: Rainbow Trout, Brook Trout, Bull Trout, Kokanee, Cutthroat Trout, Golden Trout, Mountain Whitefish, and Grayling. Equipment: 7½- to 8½-foot rods for 3- to 5-weight line, Spinning Rods with 4-6# test. Hip waders in the cooler months. Arco, Once named Root Hog. In 1901 it was renamed after Count Georg Arco of Germany. Arco, was the first City ever to be powered by Atomic Energy. Annual Mackay Rodeo: "Idaho's Wildest Rodeo". (last week of June) Rodeo begins Friday at 5 pm. Barbeque at 6 pm. A parade downtown both Saturday and Sunday at 12:00 noon, with the rodeo beginning both days at 2:00 pm. For more information call (208) 588-3180.